The global trade slowdown and the public resistance against attempts to stimulate trade through mega-regional trade deals are placing the role of non-tariff measures (NTMs) in the limelight of public discussions. 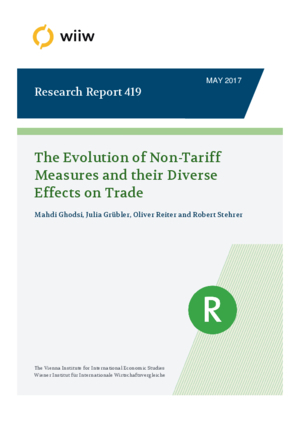 In this paper, we examine the question how different types of non-tariff measures affected global trade during the period 1995-2014. We use information on NTMs notified to the WTO from the Integrated Trade Intelligence Portal (I-TIP), which allows us to differentiate between various NTM types, including technical barriers to trade (TBTs) and sanitary and phytosanitary (SPS) measures. The two main contributions of this work are the amendment of the I-TIP database to suit econometric analysis and the estimation of trade effects of NTMs at the HS 6-digit product level for more than 100 countries with a gravity approach. Roughly 60% of all estimates point towards a trade-impeding effect of NTMs. Aggregates by NTM-imposing countries and targeted products suggest that the positive effect on the demand side compensates the negative impact on the surging costs of the supply side for SPS measures. TBTs overall appear to be trade-impeding, in particular for high-income countries in Europe and Central Asia. How do non-tariff measures matter for Austrian trade?